The flavor is incredibly smooth and creamy. The delicious sweetness of the caramel malts come on first then followed by subtle burnt sugar and molasses. After the sweet flavors dissipate a bit the flavor turns into a nice mixture of bittersweet chocolate and bitter hops. Appearance: Color is very dark brown bordering on black with ruby highlights. Nice tan two finger head that sticks around for a long time leaving behind some beautiful lacing. Smell: A solid mix of floral hops, coffee and sweet caramel malts. Molasses, raisins and unsweetened chocolate round out the smell leaving you drooling to take the next step. Initial Taste: The flavor is incredibly smooth and creamy. The delicious sweetness of the caramel malts come on first then followed by subtle burnt sugar and molasses. After the sweet flavors dissipate a bit the flavor turns into a nice mixture of bittersweet chocolate and bitter hops. The hops do a great job of clearing the palate and building a great balance to this big sweet malty beer. You can taste a little bit of the alcohol in the finish but it’s very smooth and not what you would expect from such a high abv beer. Thoughts: The problem with being at the top of the craft beer food chain like Dogfish Head is that you come to expect nothing but the very best from their beers. And Indian Brown Ale is yet another jewel in their ever growing beer crown. 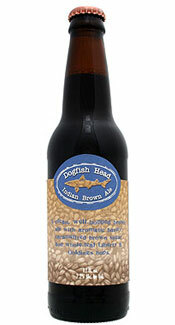 Dogfish Head considers this beer a ‘hybrid’ mixing an IPA and an American Brown Ale. The result is a beautifully smooth sweet malty beer with a nice hoppy backbone. The flavors of the organic brown sugar and bittersweet chocolate from a American Brown Ale are balanced to near perfection with a hopping regiment of an IPA leaving a flavorful beer with high drinkability. I highly recommend this beer to anyone who likes beer. This ‘hybrid’ beer will appeal to both hop and malt lovers. Another home run from the guys at Dogfish Head. Next: Spring is in the Beer! Wow, this beer sounds like it’s RIGHT up my alley. Love brown ales, I’m warming up to IPAs, and I love the idea of an imperial brown ale. Have you had the Wilco Tango Foxtrot (WTF?) beer from Lagunitas? Your description of this Imperial Brown sounds a lot like my reaction to the WTF. I’d be curious to hear your notes in comparison. Putting this beer on my list to find, thanks for the recommendation! @Royce I actually JUST grabbed a bomber of the WTF (great name) this weekend. I have yet to try it. I can’t wait. Is it a brown ale style of beer?